This week I had to have a minor dental procedure... well at the time I didn't think getting a tooth yanked out was "minor" but in retrospect, I was being overly dramatic. In my nervous preparation for the day, I went to the grocery store and grabbed random items to make myself some interesting smoothies. They had to be interesting because if I can't chew, a glorified glass of juice is not gonna sat-sis-fy. These 2 smoothies were passable as real meals. I admit to wanting nachos a few hours after one of them, but that was not so much hunger as it was an apparent inner-masochist thinking it would be funny to introduce my freshly violated gums to sharp corn chip shards. The first is a vanilla date smoothie. I should preface right now that I am one of those weirdos that actually LIKES the taste of soy milk... no, it is not a good substitute for milk if you like milk. It's soy milk, and I like it for what it is... sweet earthiness. But if you don't like it feel free to sub real milk or almond milk and some vanilla extract for the vanilla soy milk this recipe calls for. 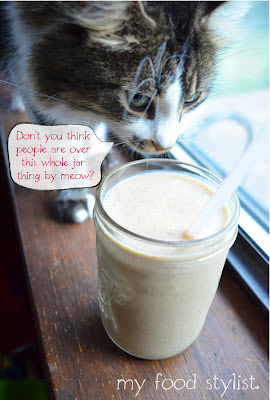 You'll want to make this smoothie... dates are one of natures original candies. Sweet, caramelly, chewy fruits from the dessert. In this smoothie, which tastes more like a shake, the dates give forth a crude honey sweetness that is quite gratifying. Combine all the ingredients except the ice in a blender and puree. Add the ice and blend until smooth. The next smoothie is honeydew, cucumber & cilantro. In case you haven't figured it out by now, this is indeed summer in a glass. The creamy yogurt and a dash of salt gives it some validity as a dinner. Subtly sweet from the melon and cucumber and vivid from the cilantro, this is like drinking Pantone 375C. So, you guys... I'm hooked on smoothies now. What is your favorite? I have never tried dates in a smoothie, but now I am on it! Also, your pictures are looking stellar.